(Life on earth is a living experience. Let the death of Fransiska be a lesson for many of those who come after her). Fransiska, from Jakarta, was thirty-two years old when she found a 1.6 cm lump in her left breast which was diagnosed as cancer. At about the same time, her father had died of cancer. In November 2004, she underwent a lumpectomy in a Singapore hospital. Unfortunately some lymph nodes in her arm pit were also infected. After surgery, Fransiska received thirty-five radiation treatments. She was well after the treatment. In January 2007, i.e., two years after the radiation treatment, Fransiska was told that her cancer had spread to her lungs. She underwent chemotherapy and received six cycles of Taxol and injections of Herceptin. Each Herceptin injection cost S$2,500 and Fransiska had eight injections. Her oncologist thought she should continue with Herceptin but she decided to stop after eight injections because she could not afford to pay for the treatment anymore. In July 2007, Fransiska was put on tamoxifen. A month later, a bone scan showed the cancer had spread to her spine, T 12. In January 2008, a brain scan showed a 8 x 7 mm mass in her brain. There was also a 1.4 x 9.0 cm mass in her liver. Fransiska was asked by her doctor to stop taking tamoxifen. She was prescribed oral chemo-drugs – Xeloda and Tykerb (lapatinib). A three-week treatment of Tykerb cost S$2,500. Fransiska told us that she was aware of the “bad effects” of medical treatment but she had no choice. She did not know what else to do except to seek doctors’ advice. In November 2004, Fransiska started on a juicing program with apple, beet root and carrot (ABC). She also took apricot seeds (source of Vitamin B17), cloves, black walnut tincture and wormwood. In addition she took IP6, spirulina, Perfect Food and high dose Vitamin C. She stopped all these intake in 2007 when the cancer had metastatised to the lungs. In February 2005, she underwent a detoxification and rejuvenation program with ABC juicing and coffee enema. She continued to do this until she found traces of blood in her urine. She stopped this program. Fransiska also took pineapple and papaya. Fransiska was aware of the need to eat healthy food. She was on fruit and vegetable juices, and she avoided white sugar, oil, egg, all meat and processed food. She took shark cartilage but later stopped it because it was not effective. metastasis in both hepatic lobes. 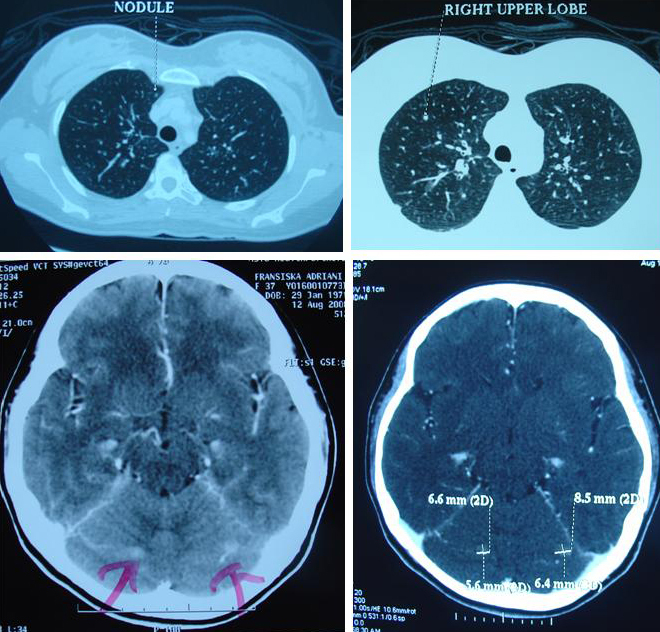 The largest lesion in the left lobe measures 2.0 x 1.8 cm and the largest in the right lobe measures 1.5 x 1.4 cm. Sclerotic focus in the T12 vertebral body is stable. She continues taking Lapatinib; receives regular injection to strengthen her bone and take medication to relieve her menopausal symptoms. Earlier, Fransiska was treated with Zoladex to stop her menses. Fransiska wrote me often to ask for help. The last email I received from her was on 30 October 2008 when she complained of gastric problem. It is with sadness that Fransiska slipped into coma and she died 2 days later, mid-December 2008. Her death came four years after being diagnosed with breast cancer. Even the most expensive and up to date drugs for cancer could not save her. This is a tragic story indeed but which has been played over and over again – breast cancer turned Stage 4 and incurable. What has gone wrong? In fact, nothing had gone wrong! Fransiska followed what her doctor wanted her to do. She received the state-of-the-art medical treatment inSingapore. Yee, a 40-year-old lady from Penang also died in similar way. She had an early stage breast cancer. Underwent surgery, chemotherapy, radiotherapy, took tamoxifen and Tykerb besides receiving Herceptin. She ended up with mestatsis to the lungs, bone, live and eventually brain. She died after spending more than RM 100,000 for the treatment. At CA Care, over our thirteen years of experience, we observed three phenomena that tend to occur among breast cancer patients. 1. One, our data show that breast cancer patients (in Malaysia) who underwent surgery, chemotherapy, radiotherapy and took tamoxifen suffer metastasis to the bone, lung, etc. after a few years. Those patients (in Indonesia) who turned to traditional medicine or who did not receive the standard medical treatment did not suffer much metastasis or suffered metastasis much later. 2. Young patients who underwent a full package of medical treatment for breast cancer tend to suffer severe metastasis. 3. Now with the availability of Herceptin, we begin to see patients suffering from brain metastasis. Is there any correction between this treatment and brain metastasis? We recognise that our observations are anecdotal and therefore can be disputed. A search in the net yielded some results which are indeed worthy to take note of. Amy’s story is not much different from Fransiska’s. There is no cure for metatastatic breast cancer, but it can be treated. Some women may develop liver damage while taking Tykerb. In some cases, liver damage may be severe and may cause death. The side effects of Tykerb include: nausea, vomiting, heartburn, loss of appetite, red, painful hands and feet, rash, dry skin, sores on the lips, mouth, or throat, pain in the arms, legs, or back, difficulty falling asleep or staying asleep, shortness of breath, cough, coughing up pink or bloody mucus, fast, irregular, or pounding heartbeat, tiredness or weakness and swelling of the hands, feet, ankles, or lower legs. Patients need to remember that to be able to treat cancer does not mean cancer can be cured! To cure is to spend a lot of money but the treatment does not cure. Shrinkage of tumour is also not a cure! Lapatinib causes liver damage. Is this not what happened in Fransiska’s case? The side effects of Herceptin include: Fever and chills (commonly occur during the first treatment), breathing and heart failure, diarrhoea, headache, nause and vomiting, pain, skin rash and weakness. However, what are most disturbing are reports about Herceptin and brain metastasis. It is known that patients with metastatic breast cancer are more likely to develop bone metastasis but patients who recive Herceptin appear to be at increased risk of subsequent development of brain metastasis compared to bone metastasis. Metastatic breast carcinoma to the CNS (brain) is common among patients receiving Herceptin. Approximately 6 to 16% of women with metastatic breast carcinoma develop brain metastasis but patients who received Herceptin as a first-line therapy had a high risk of developing CNS (brain) disease (42%). The question we may wish to ask: how relevant is the above observation to Fransiska’s brain metastases? What could have happened with Fransiska did nothing – would she die of breast cancer within four years? What could be the real cause of her death?